April 10, 2012 – Five Year Anniversary of Diagnosis > New Website for Caregivers! I am tickled pink to know that this website continues to be viewed around the world daily! Through viewers’ posts and emails, I have learned what an immense relief it is to other caregivers to know that they’re not alone and what to expect with this complicated disease. To offer better support and insight to caregivers throughout their ongoing journey, today we are proudly revealing our new website: www.FranklySpeakingAlz.com! I hope that you will share and pass on this new site to others who are struggling with Alzheimer’s. A new PROBLEM/SOLUTION format imparts the priceless lessons I have learned as a caregiver. Plus, the new WEBISODE SERIES format starts at the beginning of my family’s story, revealing in much more detail the roller coaster ride that overran our lives, including footage of all my family members to demonstrate the complex dynamics of a family in turmoil. Please know that, because there is such useful information here, I will continue to keep this Original Blog LIVE, but I will no longer be posting to it. You can always find my Original Blog at www.FranklySpeakingAlz.WordPress.com or simply by clicking the bright red ORIGINAL BLOG button on my new site! Good luck to each of you on your journey and please stay in touch by subscribing to my new Webisode Series at www.FranklySpeakingAlz.com! Independence Day brings reflection and pride. 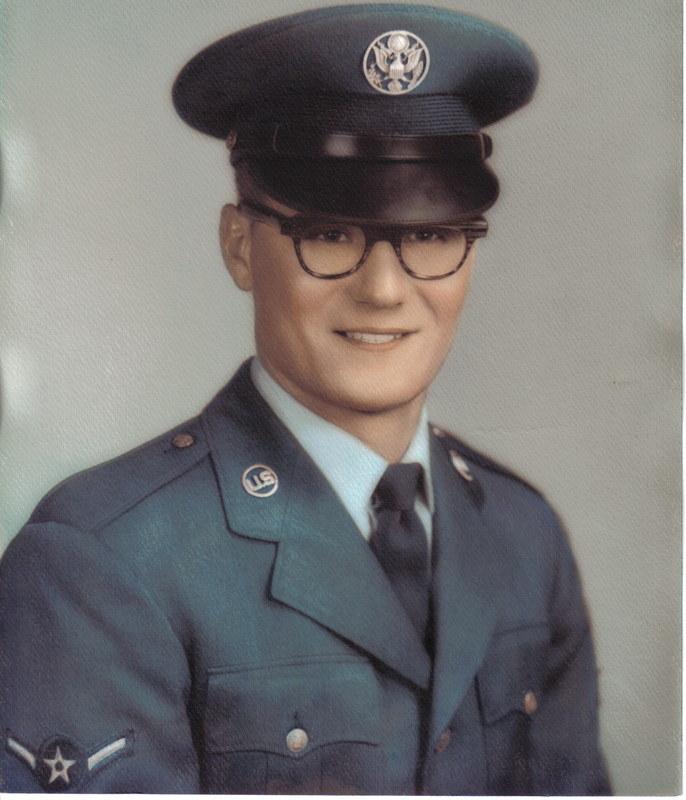 I think of my dad who proudly served his county (Airman 1st Class, The U.S. Air Force) and believed that it was simply part of his duty to preserve this privilege and comfort called the USA to which so many of us have become accustomed. He loved freedom, stepping up, helping a good cause, and giving. He believed that his military experience helped shape him into a good man, a gentleman, someone who appreciated a good challenge and learned to persevere despite all obstacles. I fondly remember learning to make the bed as a child, fastidiously trying to create perfect “hospital corners”. My dad wasn’t militant; he simply passed on his knowledge in a fun, creative way that made you want to learn. Every fold was a connection to him – who he was in that moment, who he had been before I was born, who he hoped everyone would step up to be. I yearned to be that person in his eyes. And he was undoubtedly my hero. 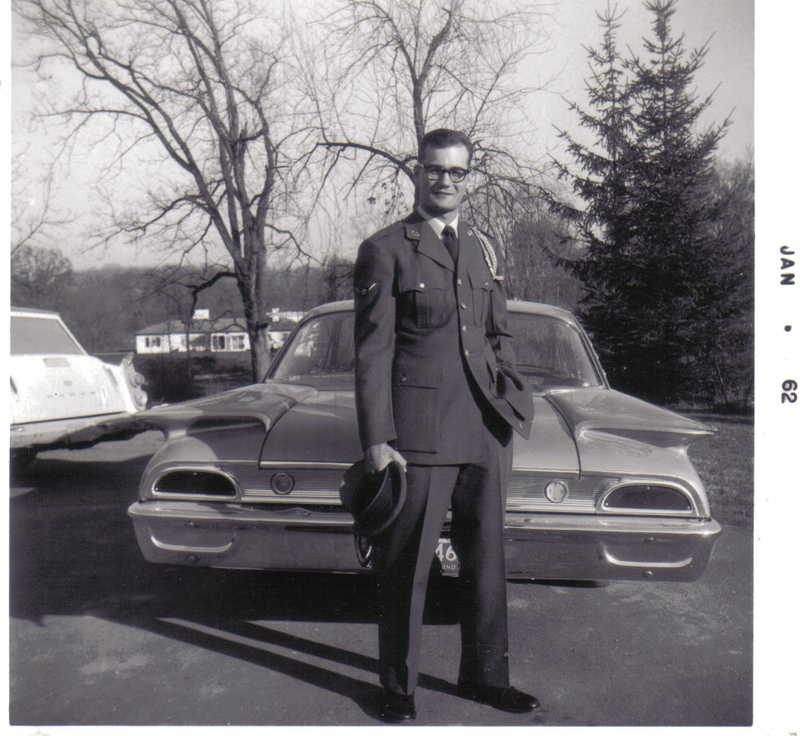 I am so full of pride and thankfulness this weekend for my dad and ALL others who have served. Their selfless and countless acts of kindness. Their bravery while walking unknown territory. Their perseverance to overcome what was thrown at them. And their goal to be standing alive at the end of the battle. I can’t help this year but compare the military experience to the Alzheimer’s experience. They seem to me to have a lot of similarities. Of course, there are those who have Alzheimer’s and bravely walk to the edge. But I’m thinking more along the line of Those Who Serve Those With Alzheimer’s. These people are true heroes in today’s society. They don’t personally have the disease so they don’t have to take this journey – but yet somehow they choose to accompany someone else on their harrowing journey. I believe THIS is the compassion and love and dedication that was represented in those “hospital corners”. I have a few friends who’ve recently lost their beloved parents to Alzheimer’s. Barry is one of them; he lost his mother ten weeks ago after being her primary caregiver. Barry is wonderful, kind, funny and giving. But Barry is struggling right now with some intense emotions, inexplicable thoughts and sporadic behavior. And he’s apologizing for it. It’s ALL part of the decompression process. You may find yourself doing crazy things lately, and that’s just you trying to come to terms with what the *BLEEP* you just witnessed and survived… and now you’re taking stock of the rubble of your life, trying to make some sense out of it all, and needing to pick a direction to start moving in to restart your life. Trust me, I get it. You’ll be okay, eventually. As I was typing these words to him, it struck me for the first time how much Caregivers really are like Veterans of War — and how important our role is to help each other re-assimilate when it’s all over. I mean, we’ve really witnessed some harrowing things. Through the process we’ve questioned ourselves and God, and we have had to discover what honor and duty truly mean. And when the battle is over for each of us and there is nothing left to defend, we find ourselves standing alone in the middle of the field, blinking in disbelief, and wiping the proverbial ash off. But the truth is, we aren’t standing alone. We are among millions of other Caregivers who get it. There are millions of people wanting to hug us, tell us Job well done! and welcome us back. Veterans are always the knowledgeable ones who have lived through the experience and can now help lead the way. Make it a point to hug a soldier, salute a flag, and to ask your fellow neighbor what you can do to help them during their battle with Alzheimer’s. Let’s unite and become stronger as one – because there is strength in numbers and in believing you will survive. Let’s change the world one “hospital corner” at a time. 6/18/11 – Who’s Story Is This? When I started blogging years ago, I wasn’t sure where my story was heading. I was clear, though, that it was a story about my dad living with Alzheimer’s. I gave some backstory and then used the blog to report on my dad’s health status. It was only over time that I truly realized what I was really up to – I was spilling the truth about what was happening to me and around me during the great Alzheimer’s slide. Somewhere along the way, the story of my dad having Alzheimer’s morphed into how I was reacting to my dad having Alzheimer’s. It became the story of Alzheimer’s through my eyes, the eyes of a caregiver. Blogging in the middle of the night, I’d think, If I can help just ONE person, it will be worth the effort. If just ONE person visits this site and gets some relief by reading this, the project will be a success. And then an amazing thing started happening – I started getting comments from people I didn’t know who were actually connecting with me. I was making a difference! So I continued blogging and telling the story, digging deeper into my emotions and psyche so that I could truly understand what I was going through so that I could accurately report back. It became my self-proclaimed duty. And so I wrote, I cried, I celebrated small victories, and then my dad died. There was a natural tapering off of my blog entries as I took much-needed time to grieve my loss. I would check back in by posting a new entry on milestone events like holidays or anniversaries. But after 6 months I started thinking to myself, Well, now I’m just talking to talk. No one cares what I’m up to – this story was always about Dad. Now that he’s gone, there’s no more story. Cowboys have a classic stereotype of being tough, but I’m here to tell you that they’re really softies inside! 🙂 I think Dad knew the truth – he always wanted to grow up to be a cowboy. Which makes this tale even better! Life goes on for the family outside of Dad’s 4-walls, but we always get back to him as soon as humanly possible and we are spending a lot of time there this past week. In an effort to squeeze in meaningful visits and let him know he’s not alone, my immediate family has begun taking shifts around the clock at Dad’s home. I personally believe that Dad knows how much he is surrounded by love, even if he is sometimes physically alone, but there is no harm in someone being there all the time to speak lovingly to him and hold his hand or scratch his back. Some loving cousins and uncles have volunteered to take shifts in order to help out, which makes me realize that I should mention to everyone out there that if you’d like to visit Dad, please just let me know. This would allow one of us to take a break. Forgive me if I sound a bit automated with this written recap. The accompanying video clip will tell you the additional information you need to know. Unbelievably, it was nearly a week ago that my father was transported by ambulance from Sunrise Assisted Living to Botsford Hospital’s Geriatric Psychiatric Ward for Involuntary Admittance by the State after repeated bouts of aggression and physical violence at the nursing home. Apparently, this is a new stage he’s at in which you never know when the aggression is going to rear its ugly head. Our family and friends have never personally witnessed one of these full-blown outbursts. Dad was initially transported to Botsford last Tuesday afternoon and he wasn’t allowed visitors until Thursday evening when Mom and Frank Jr. went. Mom then went back on Friday, only to be told that Dad was tranquilized and in isolation and that it had taken 3 security guards to hold him down for the tranquilizer shot. The next day, I visited Dad at the Psychiatric Ward for my first time and I left with a heavy heart. The few positive things I can tell you about this experience is that, first and foremost, the point of the hospital admittance is so that Dad can be strictly observed while his meds are tweaked until we discover the magical combination of drugs to return him to a calmer, happier, more peaceful state of mind. Also, when we visit and explain to him why he is there, he agrees he should be there, he shows a heroic willingness to want to “get better”, and he can’t stand the thought that he might harm anyone (isn’t that SO much more like him?). Lastly, I had a loving, heartfelt visit with Dad on Sunday – Valentine’s Day. I will never forget that visit with him. It melted my heart with love and helped make up for the sadder visit the day before. However, it is touch and go and today Dad was in isolation again when visiting hours began. Mom and Frank Jr. were there and were allowed to help Dad out of the isolation room, but I am told that it required a wheelchair and that it took nearly half an hour until he was conscious or aware enough to look them in the eye or respond to them in any way. Before leaving, Mom gave Dad his first shave in a week while Frank Jr. held him up in a chair. Mom says she is getting used to all the drama that seems to endlessly come our way… but I somehow just can’t believe it. Sometimes I can’t believe any of this. A room has become available for Frank at Sunrise of Northville, across the street from me. Now I will have to travel 2 minutes instead of 25 minutes each way! Move in day is scheduled for Monday. I’ll let everyone know how he’s doing.